This granola is the crispiest, best-tasting granola I have ever had! I love having a bowl of crispy cereal with cold almond milk for a treat. 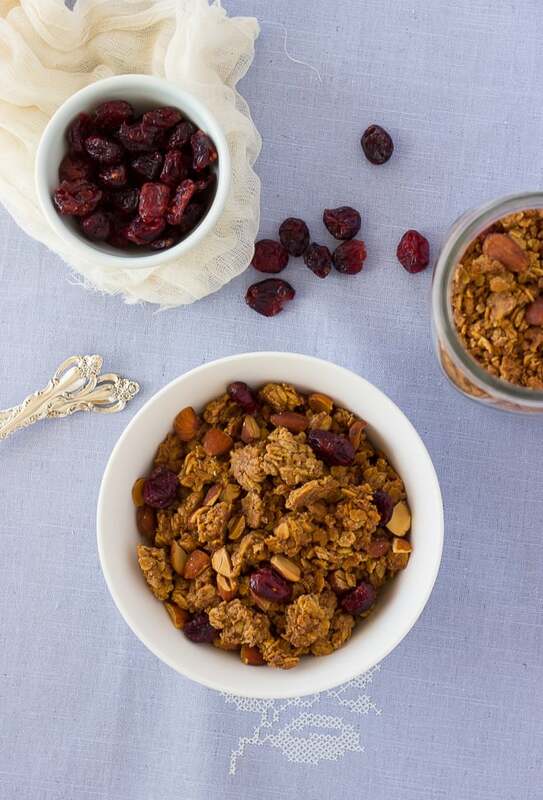 And this granola is something you can feel good about indulging in! It is much lower in sugar than any granola you’ll find on the market and totally customize-able to your tastes. 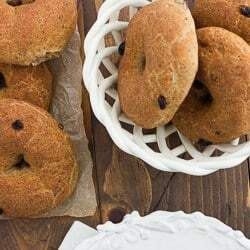 I love adding coconut flakes and dried cherries to mine. Why take the time to soak your granola? Soaking the oats overnight makes them easier to digest by breaking down the outer barrier called phytic acid. All grains contain some level of phytic acid, but oats are particularly high in it. Phytic acid is hard on your digestive system and blocks the absorption of zinc, iron, phosphorous and magnesium. Soaking grains makes them easier to digest and the nutrients more bioavailable. Drying the granola at really low heat preserves nutrients. I also include raw buckwheat groats while soaking the oats, because the groats are high in an enzyme called phytase which aids in breaking down phytic acid. 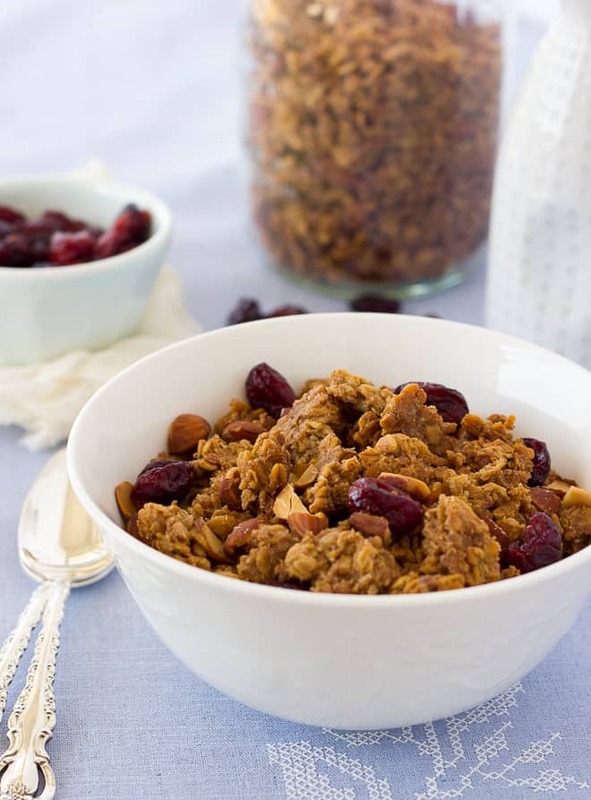 This recipe makes a huge batch of granola! One batch lasts in our house for over 2 weeks. After soaking the oats, you dehydrate them in the oven for 8 hours. This may seem a bit long, but it is mostly a hands-off process and well-worth the results! My 2-year-old loves this granola and I feel much better about giving him this as a snack rather than processed breakfast cereals. I love this granola with almond milk or over fruit /coconut milk yogurt. I also love keeping a little bag in my purse for a little pick-me-up when I’m on the go. Place all the ingredients for soaking into a large bowl. Stir to thoroughly combine. Then cover and let sit at room temperature for 24-30 hours. After 24 hours, preheat the oven to 200F and line 2 baking sheets with parchment paper. Mix the maple syrup, salt, cinnamon, and vanilla into the soaked oat mixture, until evenly combined. Pour half of the granola mixture onto each baking sheet. Spread into a thin, even layer. Bake the granola at 200F for 8-10 hours, until very dry and crispy. 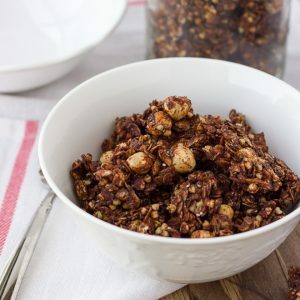 To insure crispy granola, flip and mix the granola around on each sheet tray every 2 hours. After the granola has dehydrated, I like to turn the oven off and leave it in the warm oven overnight. Serve with almond milk, over fruit/yogurt, or eat it by the handful! Enjoy! This turned out great for me Erin! Though my house smelled like maple for days after. Good work! Hi Hannah! I do soak the oats to make them more digestible. I think rinsing oats could be tricky but you could definitely try it. I hope you like it! 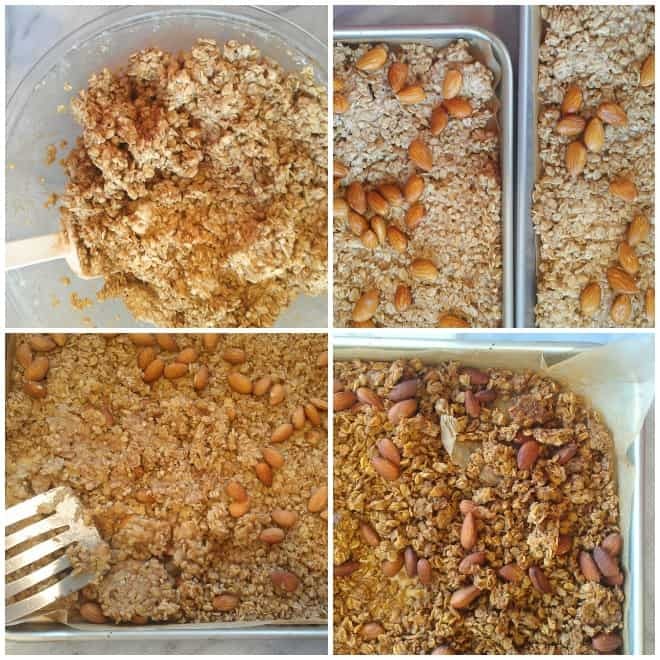 Oats don’t need to be rinsed, but the Almonds could be soaked separately, drained then mixed in after they’re rinsed. I love this granola, and so does everybody else I (might) share it with, especially my 2 year old. I have made it several times and this time around Im incorporating fresh apple, we have a tonne off our tree so that should be good 🙂 im expecting a longer dry time tho. Its fantastic how it fills the house with good maple smells as it dehydrates. I cut the maple back in the recipe to 1 cup, as we are used to porridge with no sugar so it goes over fine. Maple syrup is quite pricey! I soak all of my grains these days as they used to make me ill every time I ate them, especially store bought granola, couldn’t touch it. So it was a real pleasure coming across your recipe 🙂 keep up the good work! Thanks Mia! I’m so glad you like it. That’s great to know about cutting back on the maple syrup. I’ll have to try using less myself. It’s always nice to use as little sweetener as possible! This sounds delicious but I can’t have almonds – any recommendations on what I can use in place of them? Thanks!